There are special events such as the annual fete. You’ll find more information on their respective pages. Pentecost Celebration on Sunday 24 May 2015. There will be a BBQ meal after service. 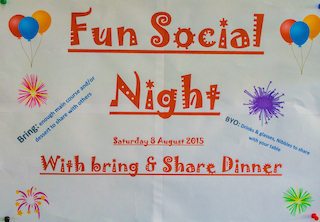 On Saturday 8 August Holy Name is having a “bring and share dinner” to celebrate Holy Name Day. This is not a fund raising night and there is no charge but parishioners are asked to put their names and the number of guests on the sheet in the narthex and to bring a dinner and dessert to share with others attending. Christmas Raffle 2015: Tickets are now available for the Christmas raffle. Please buy and/or take some to sell. The prize is a great Christmas hamper. The raffle will be drawn on Sunday 6 December so get in early for your tickets which are in the narthex (or see Helen). The result is wonderful. Helen won the hamper twice! Here goes the story. The first winning ticket was drawn and Helen’s name was on it. She kindly declined and suggested a redrawn. The second ticket had her name on it again. It is her destiny. Congratulations. In the past, and currently, we have the opportunity to buy items such as jams, cards, scarves, etc. made by parishioners for which the parish is very appreciative. These will continue to be available. However, on Sunday, 14th May after the 10.30 service, the Social & Fund Raising Committee is instituting a “Parish Trading Table” on which these items and others will be available for purchase. The Committee is asking parishioners to donate items such as craft, excess produce from your garden, cakes, biscuits etc. for sale – maybe even excess wines & spirits (but please not used items). All proceeds will help with the parish income. If the May table is successful, the Committee hopes to make the event a regular occurrence. Please consider what you can do to help.